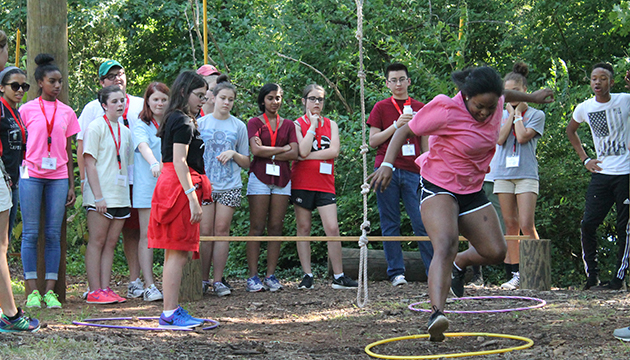 The Media & Leadership Academy at Grady College is an intensive residential one-week program focused on experiential learning. This program is open to rising high school sophomores to seniors interested in the mass communication field. 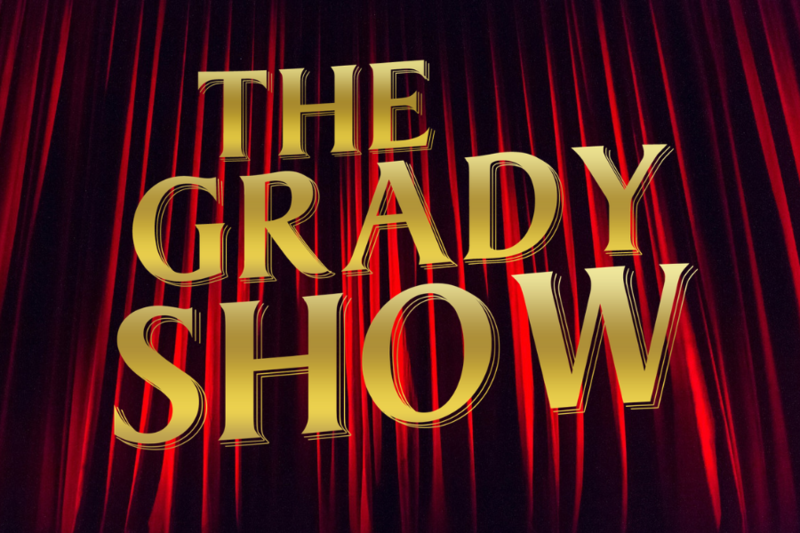 Incoming UGA freshmen who intend to study at Grady College are also eligible to attend. Participants will choose from one of the three offered tracks: Journalism, Advertising & Public Relations or Entertainment. Participants will spend the first half of the week learning about their chosen track. In the second half of the week, they will develop more specific skill sets based on their interests by working on teams to complete a class project. Academy participants will stay in a residence hall during the week. Accepted students can choose their roommate or a roommate will be assigned. Academy counselors (current UGA students) will stay with the students and will respond to needs and make sure students are in their rooms by the curfew. Please visit the UGA Residence Halls website for details about the accommodations. Nightly activities throughout the week will provide opportunities for participants to network, build connections and have fun. A complete application is required by May 3, 2019, in order to be accepted into the Media & Leadership Academy at UGA’s Grady College. Space is limited in each track and only 60 students will be accepted into the Academy. Rolling admissions until May 3. Please send the completed application to journalismacademy@uga.edu. The program fee is $550 per student. Once accepted into the M&L Academy, fees can be paid via an online system. A $50 deposit is requested to secure a spot. The balance is due May 17. A separate form and additional materials will be needed in order to apply for a need-based scholarship. Scholarship recipients will be notified on or before May 10, 2019. If space permits, scholarship applicants who are not awarded a scholarship will have until May 17, 2019, to reserve a space in the Academy with payment. Questions? Contact us at 706-542-5022 or journalismacademy@uga.edu. Want to join the ranks of the “Mad Men” or women? In the AD&PR track students will learn how to become creative problem solvers, writers, decision makers and persuasive communicators within traditional and new media. In the first part of the week, students will take introduction classes in the advertising and public relations fields. During the second half of the week, students will choose a non-profit organization to sponsor. Students will experience teamwork and collaboration as they find ways to reach target audiences and effectively communicate their message to the general public. They will be divided into two groups and each will produce a project. One group will produce a mini advertising campaign, while the other group will produce a mini PR campaign. Calling all the screenwriters, editors, camera operators, producers and directors! Discover in the entertainment track how to tell stories and share stories through video production. In the first part of the week, students will be introduced to the entertainment field and what it encompasses. Students will learn the basics of video production, from operating a camera to digital editing. Additionally, the basics of screenwriting. During the second half of the week, students will work with the advertising group to create a short commercial or PSA, promoting the non-profit organization. The journalism field is evolving to encompass multiple platforms. In this track, students will acquire some of the tools to needed become a multi-skilled journalist in this digital age. In the first part of the week, students will review and learn the essentials of writing for print, online and broadcast. They will practice the art of interviewing and reporting. Furthermore, they will learn the basics of producing a broadcast and the fundamentals of photojournalism. During the second half of the week, students will experience teamwork and collaboration firsthand in a newsroom. They will be divided into two groups and each will produce a project. One group will produce a news website, while the other group will produce a broadcast show. Speciality topics include sports journalism. Nightly activities are offered including Grady After Dark, movie night and game night. Are you a school teacher in Georgia interested in taking your students on a field trip to learn more about journalism, video production, advertising or public relations? If so, you should come visit us at Grady College! 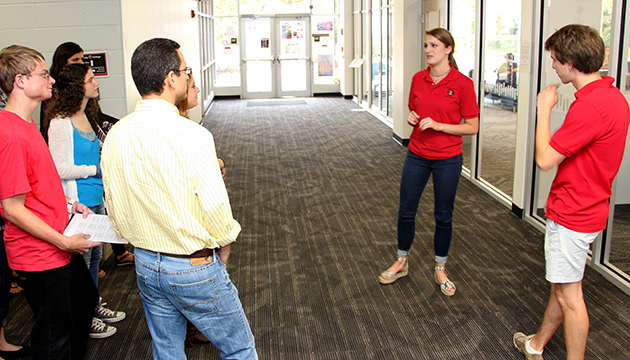 Depending on your needs, we will develop an agenda where your students can tour our facilities, learn about the school and majors offered, and hear from faculty, staff and students. Unable to travel? Let us come to you! We can talk/present on specifics regarding the topic you choose. 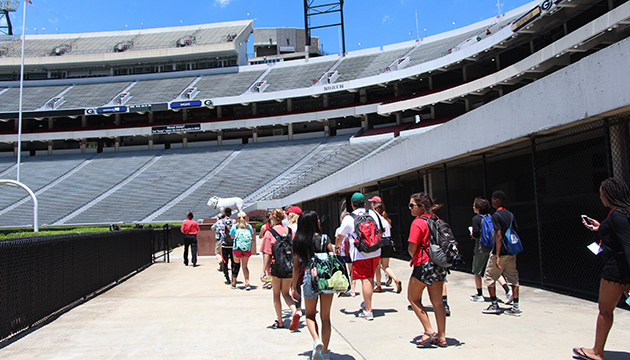 For more information on the high school visits or to schedule one, please email gspa@uga.edu.